I used to say that I can cook but I can’t boil an egg. Boiling an egg was (in theory) the first thing you learned in the kitchen but it was something I found difficult to master. Too many variables! Egg size. Egg temperature. Water temperature. Timing. End result – unknown until you crack the top. Egg yolk – solid, runny or too far gone with an unappealing ring of green. White just set and perky or with the consistently of the snot from a runny nose. I am proud to say that I can now raise my slotted spoon in triumph – I can boil an egg! 7 minutes. That’s the trick. The writer of one of my favourite food blogs Orangette published this piece in Saveur with beautiful prose and a simple message of 7 minutes to boiled egg success. Bring a small pot of water to the boil (just enough to cover your eggs, we are talking a comfortable bath not a swimming pool). Gently lower your room temperature eggs into the water with said slotted spoon and set your timer for 7 minutes. 6 minutes 30 if you enjoy a really runny roke (yolk). When the timer trills remove the eggs and either run under running water then peel, or dump in your cutest egg cup and serve with buttered toast soldiers. Next up, my easy scrambled eggs for two. 4 eggs and a slosh of milk or cream. A slosh is a bit bigger than a splash. Add a bit of salt and pepper and slightly scramble with a fork until the yolks are broken but you still have streaks of summer orange. Heat a knob of butter in a small non stick frypan over a low heat. Once the butter has melted, pour in your eggs. You can crumble over cheddar at this point for slightly fancier eggs. Gently scrape your spatula across the bottom of the pan every minute or so to loosen the cooked egg. Be kind, the eggs will be creamier with your tender treatment. The eggs are cooked when they are still just a touch runny. The residual heat from the eggs and your warm toast will finish the cooking process. Finally, the scariest egg of the kitchen, the poached. I have tried many methods, the most successful of which was placing a piece of cling wrap over the top of a glass and cracking an egg in the middle. Wrap up tight and place into simmering water. I saw a chef on TV the other day poaching eggs in a sieve submerged in water. It works, but it’s not necessary. I refer to Yottam Ottolenghi for his method – so easy! Fill a small saucepan with just enough water to submerge your eggs (you can do more than one at a time providing your eggs have a bit of safety space in the water). Add a splash of vinegar and bring to the boil. Crack a room temperature egg into a cup and then pour your egg into the water. Remove the pan from the heat and set aside for about 4 minutes. 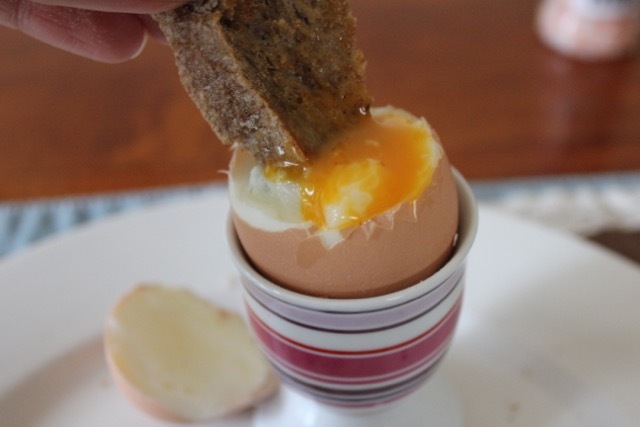 To test if the egg is done, remove with your slotted spoon and give it a gentle nudge with the tip of your finger. The white should be firm and the egg slightly spongy if you like it runny, firm if you don’t. Eggs are super nutritious and delicious – a complete meal in a speckled shell. What are your special egg recipes?